Should the Left Leg Straighten on the Downswing in Golf? One of the controversial aspects of Tiger Woods' golf swing is the way he straightens his left leg before impact. The schools of thought on Tiger's move differ between whether his motion provides more power, or leads to leg and knee injuries like the ones Tiger has suffered. If you are right-handed player confused or concerned about how to move your left leg during the swing, there are several options to consider. Johnny Miller, a tour player who transitioned to the broadcast booth, claims that straightening his left leg on the downswing caused knee issues that plagued his career. While straightening the left leg allows you to rotate your upper body more quickly on your downswing, it also places tremendous stress on the knee joint. Miller advises golfers with knee problems to keep the knee bent on the downswing. Ben Hogan made this adjustment after suffering near fatal injuries in a car accident. If you make this adjustment, Miller says, you might lose some power, but you’ll make up for it with straighter shots. While winning three U.S. Opens in his younger days, then dominating the senior PGA tour for a decade, Hale Irwin earned a reputation as one of the best long iron and fairway wood players in the game’s history. Instructor David Leadbetter credits Irwin’s bent left knee at impact for his success hitting these difficult clubs. According to Leadbetter, keeping the knee bent allowed Irwin to stay down on those shots. Irwin was able to keep his clubhead low to the ground and sweep the ball into the air. Leadbetter suggests copying Irwin’s bent knee if you want to sweep your long clubs off the fairway. If you want the power that comes from rotating your upper body around a straight left leg, instructor Zach Allen suggests learning the proper sequence for the move -- and using it only when you need an extra bit of power. You want to straighten the knee, but don't snap it at the start of the downswing. He says you should feel like your knee stays flexed until just before impact. Then, push your weight into the ground with your left leg just before impact. Your leg will straighten, your hips will speed up and your club will whip through the ball. 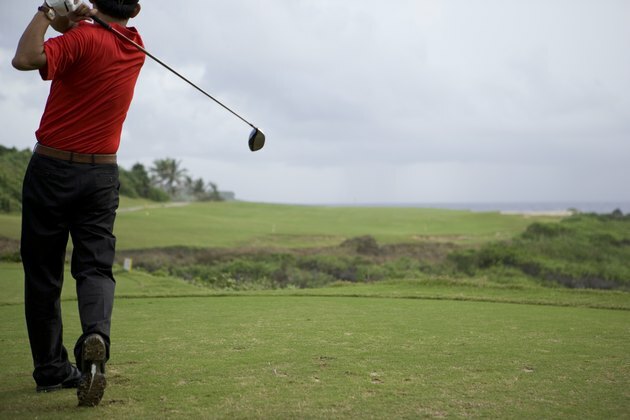 Golf instructor Scott Young says it’s okay for your left leg to straighten in the downswing and post up into a straight position through the finish. This movement will prevent you from moving laterally on the downswing, which weakens your impact. Young says when you strike the ball, your left hip has to be higher than the right when you make contact. The left leg doesn’t have to be rigid at impact, but it should be in the process of straightening.